Wrong. Lace-up knee braces haven’t been a preferred bracing technology in decades for multiple reasons – lack of support, restriction of athletic performance, and durability to name a few. We’ve found that while ATC’s would never consider using a lace-up knee brace on their athletes, they commonly advise them to use lace-up ankle braces despite the functional similarities between the two. Rapid Loss of Support – The goal with any brace is not the support you achieve when you first apply the brace, but the support you maintain in 30-45 minutes of wear during activity. One primary goal of bracing is to provide “long-lasting support” and to achieve this goal the mechanics of the brace must move with normal, non-injury joint range of motion (ROM). When a brace can move with the joint, not against it like with lace-ups, the straps are able to stay securely in place and remain tight, maintaining long-lasting ankle support. Any brace that loosens during wear will experience a rapid loss of support during activity and will gradually stretch out over time reducing its long-term effectiveness. Restricts Normal ROM & Athletic Performance – Every advanced knee brace is designed upon the principle of allowing non-injury joint ROM while providing long-lasting support. Both lace-up knee and lace-up ankle braces restrict normal, non-injury ROM so in turn they end up losing support rapidly while also restricting athletic performance. 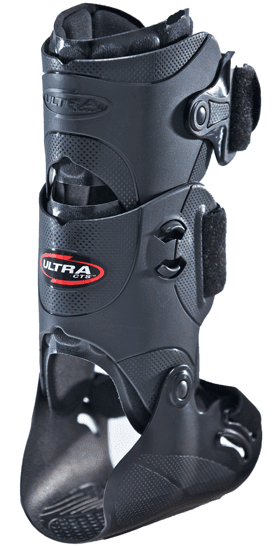 Not Budget Friendly – One of the few perks for purchasing a lace-up brace is that they’re relatively inexpensive and readily available. While the initial investment may be low, don’t let the price fool you. Due to many factors such as rapid loss of support, cleanliness, quality of materials, and durability lace-up braces tend to stretch out, stink, and need to be thrown away after each sports season, if they even last that long. The cost of wearing a cloth, lace-up brace that houses bacteria and needs to be replaced often ends up being more expensive over the long run than investing in an advanced hinged brace that can last multiple years and playing seasons. If you remember the days (in the 1970s) when wearing lace-up knee braces was the norm, you probably can recall some of the negatives associated with them and how relieved you/athletes were when new, hinged knee bracing technology came onto the market offering more long-lasting support and unrestricted athletic performance. The same transition to a more functional technology that happened with knee braces is now happening with ankle braces. Not convinced that lace-up ankle braces are an outdated technology? Leave us a comment below, or send us a message! We’d love to discuss our technology a little further with you, set up a demo, or see if you qualify for a free ankle brace sample for your team.